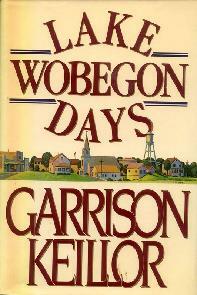 This morning, I forgave Garrison Keillor for his transgressions real or imagined. I sent him my words of forgiveness through the contact form on his website. 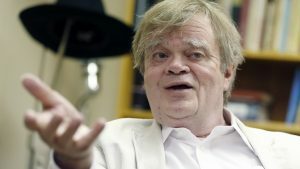 You may or may not know Garrison Keillor or anything about him. I know him as a magical writer who has brought smiles to the masses with his wonderful musings such as Lake Wobegone Days and his longtime PBS radio hour A Prairie Home Companion. Last winter, when allegations surfaced against Mr. Keillor for “inappropriate behavior with an individual who worked with him,” Minnesota Public Radio terminated his contract amid the ever-increasing surge of allegations against public figures. This type of inappropriate behavior is regrettable and inexcusable. Even so, I was compelled to send Mr. Keillor a note of forgiveness regardless of whether the allegations were real or imagined. In forgiving Mr. Keillor, I do not condone ‘inappropriate behavior,’ real or imagined, and in forgiving Mr. Keillor, I forgive countless others whose real or imagined inappropriate behavior has brought pain to others and has called them to bear the Ancient Mariner’s albatross. That would include Bill Clinton and Ted Kennedy whose morality I do not favor but whose actions – real or imagined – I will forgive. Several years ago, I read The Rag and Bone Shop of the Heart, A Poetry Anthology – originally subtitled “Poems for Men” when first published in 1992 before political correctness influenced HarperCollins Publishers to reconsider the title – edited by Robert Bly, James Hillman, and Michael Meade. I was so taken by the volume of poems that I purchased copies for my three sons and my son-in-law. Last week, I suggested to my Lifetime Pal, Pete that reading a poem every day can promote ‘balance and rhythm’ in a person’s life. I decided to gift Pete a copy of The Rag and Bone Shop of the Heart. 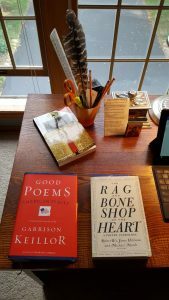 After I made the purchase but before I gave the book to Pete, I glanced at my bookcase and my eyes were drawn to Garrison Keillor’s Good Poems, American Places. Mr. Keillor’s collection of poems is another worthy assemblage of words that belong in the ‘shop of the heart.’ Together, both volumes- The Rag and Bone Shop of the Heart and Good Poems, American Places – sit on my desk. I am re-reading both, one poem at a time, one poem from each, every morning. I know the act promotes balance and rhythm in my day, but more importantly – in its odd and unconventional way – seeing Mr. Keillor’s book on my desk with his name in bold, white letters has influenced me to consider a genuine act of forgiveness that I openly extend to everyone who needs it, to everyone who at one time in my life, I may have considered unforgivable and upon whom I have passed my own, inappropriate judgement. I forgave Mr. Keillor this morning. As I was compelled to forgive him, so now, I am compelled to thank him. Indeed, God works in strange ways. Will never forget my intro with “The Book of Guys.” And Rag & Bones is one of the books always on display at my home. And let’s not forget Me by Jimmy (Big Boy) Valente as told to Garrison Keillor!